The leaking of the Labour party election manifesto may or may not have been deliberate. But the intent to reverse decades of market liberalisation of both the physical assets and service delivery of key elements of our great national infrastructure is clear. But while energy, telecoms, mail and water are now clearly seen as being owned and operated in the private sector, for the rail sector we have a situation which is far less clear, and even less widely understood. First, let’s address the biggest misunderstanding: lots of people think that our overground railways are privatised. That’s not really the case at all. Sure, the trains are owned by private sector companies which lease them to train operators, but those train operators are nearly all running franchises or concessions which have been let by arms of either central or devolved government. These franchises and concessions may be for different lengths, and may or may not require the operators to carry revenue risk as well as cost risk, and may or may not prescribe the rolling stock for the operators to use. But the key point is that the franchise or concession-letting organisations - be they the Department for Transport, Transport for London, Transport Scotland, Merseytravel, Nexus or whoever - are letting contracts in order for the private sector to deliver a public service on their behalf. So we can see that the private sector operator is merely holding the rights to deliver a defined specification to a defined level of quality for a specific period of time. This process extends to the types of train that are ordered and operated. In recent years, these have increasingly either been specified as franchise requirements or else bought directly by the Government and then handed to the franchise winner. Effectively, the impact of all this is to make the operators behave like contractors, and to make the letting authorities behave like clients. This means that while the delivery of service is in the private sector, the service itself is not privatised as it is being specified publicly. Take fares and ticketing as an example. Operators are widely lambasted for expensive and inflexible fares, old-fashioned and over-complex ticketing systems, and a general seeming lack of desire to move with the times and respond to customer needs. All of this is probably true, at least up to a point. But the principal architecture of the national fares and ticketing system is under the direct control of the DfT, where it has sat since the railways were restructured in 1994, apart from a brief spell when this responsibility was transferred to the Strategic Rail Authority during its short life. Yes, operators are allowed to set so-called ‘unregulated fares’ and to develop new ticket types, but these are constrained within the limitations of the wider system. In the 23 years since 1994, the internet has come of age. 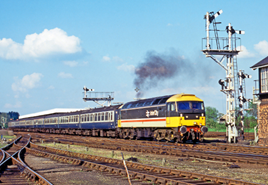 Operators have enthusiastically taken up the opportunities this has created as a way of driving demand and yield growth, but all built upon the original fares system inherited from the British Rail era. Hence fares have become more complex and more variable as the years have passed. Those with unregulated Anytime fares have been encouraged to price up to what the market can bear, in order to maximise their revenue… and they need to maximise their revenue in order to pay the level of premium that they originally bid to win the franchise in the first place. Fares and ticketing is a complicated subject (and probably worth another article in its own right), but I hope this gives enough of a flavour for us to be able to see what is really going on here: that is, that the complexity and variability of the fares system today is a product of the system specified and driven by central government. This is wholly a public sector responsibility, and has not been properly overhauled over the last 23 years, during which time so much has changed around it. This is a failure of policy, not execution. Ownership of the various elements of the system is much less important than the need for the directing mind (in this case the DfT) to determine a vision for the future of fares and ticketing, and to then set policies to enable the vision to be realised. So far, I’ve only looked at the trains themselves and the operators who run them. But what about the track and stations on which they run? Nearly all overground rail infrastructure in Great Britain is owned by Network Rail, and most of it (excluding most stations) is managed by it, too. Network Rail has internalised most of its track maintenance, and some of its renewals activity. Yet Network Rail is fundamentally a public sector business, and has been ever since the Office for National Statistics determined in December 2013 that it should be treated as such. The importance of this decision was much overlooked at the time. I remember Sir Patrick McLoughlin, who was the Secretary of State for Transport at the time, saying to me on the day that the decision was announced that he felt it was largely an accounting issue, and should not have any significant impact. I told him straightaway that I thought it was a colossally significant decision which would have major repercussions down the line. Even today, these are still only just becoming apparent. The immediate impact has been to bring Network Rail under much closer governmental control than either it or its predecessor (Railtrack) ever was. Ministers are able to instruct the chief executive of Network Rail directly, and do so frequently - either explicitly or else implicitly through nods and winks. The whole regulatory framework put in place by the Railways Act 1993, and its subsequent amending pieces of legislation, is still technically in place, but the Office of Rail and Road (ORR) has been left with a much-diminished role. It is not yet clear how well the concept of a five-year financial framework with high-level objectives agreed in advance, and handed to Network Rail to deliver with regulatory review by ORR, will survive its first encounter with the real world of politics and the all-too-obvious need to control Network Rail’s spending on enhancements. If I was trying to predict what the next five-year regulatory cycle will look like, I think it might look something like this: the Statement Of Funds Available will be for a reduced overall total; the list of enhancement schemes will be shorter and less explicit than before; there will be a renewed emphasis on value for money in the renewals and enhancements areas; and a focus on benchmarking through a much more regionalised approach to regulating Network Rail’s activities. If you have been following my line of thought so far, you will have come to appreciate that the argument about whether our railways should be nationalised or privatised is a sterile one - they are effectively nationalised already in all but name. However, what tends to exercise the minds of left-leaning politicians and the wider public at large is those pesky franchises. Why should private companies be brought in to operate public service contracts, and make a profit on these that is then removed from the industry and paid to shareholders? What makes it worse is that many of these pesky people are, in fact, offshoots of foreign state rail operators. This means, so the argument goes, that profits made for doing nothing useful in the UK are subsidising foreign state railways. Meanwhile, our own state organisation is specifically debarred from bidding for franchises. Let’s deal first with the foreign state operator issue. These organisations have identified Great Britain as an open and competitive market, one where they can bring fresh expertise to bear as well as broaden their own expertise and strengthen their market position as railways across Europe are gradually liberalised. Through bidding in Great Britain, they are exposed to the same downside risks and upside benefits as any of the private sector players. They could just as easily lose money here as turn a profit, and in being here they are doing something very important for the Government - they are strengthening the market for franchises. This acts to make the competition stronger, and thus achieve better value franchise deals. This must be good for us taxpayers here in the UK. In reality, it’s a very good job that the likes of Abellio, DB, SNCF and so on have been active in Great Britain. Why? Well, the percentage of revenue that a franchisee makes in profit is more normally called a ‘margin’. Margins are determined competitively - you bid a particular margin, but what you actually get can be more or less than this depending on whether you achieve your revenue and cost predictions as set out in your bid. Typically, margins of 5% or more were achievable in the early years of franchising. More recently, margins have tightened. Companies may bid a margin of 3.5% to 4%, but actually realise a much lower percentage than this. This happens because either revenue falls short of predicted levels, or else costs rise faster than planned. In the past couple of years, margins have averaged between 2% and 3%. While some have done well - Merseyrail for example - others, such as GTR, have made losses. Margins as low as 2% are not sustainable for franchises where revenue is at the franchisee’s risk. The owners of these companies can earn better returns by using their limited capital and expert resources elsewhere. This is why the market for franchises has weakened worryingly in the past two years, with only two bidders for the recent competition for the big South Western franchise - one that should be seen as a jewel in the crown! This also explains the recent decision by the National Express Group to get out of rail franchising in Great Britain, and its subsequent sale of the c2c franchise to Trenitalia (for what will, I’m sure, come to be seen as a very good deal for National Express). These are worrying developments. It would be possible to allow franchises to lapse at the end of their terms, and to create an in-house company to operate rail franchises in the public sector. But I don’t favour this approach, and I say this as someone who has personal experience of running two such franchises in the public sector in recent years. This is because my experience tells me two really important things. The first is that governments are not very good at delivering public services themselves -there is a tendency to meddling, short-termism, starvation of funding, and nakedly politicised decisions every time things get difficult. Much better to set out the framework of what you want to achieve over a period of time, and then contract with a focused and properly incentivised company to deliver your requirements. East Coast was undoubtedly a success during its five and a half years in the public sector. It returned well over £1 billion in profits to the Treasury during this time. But despite having chaired the company, I wouldn’t advocate running franchises this way as the norm. It worked well because we worked very hard with some top-notch very senior civil servants to make it work well, and because we ran it as far as possible as if it was in the private sector. But because it was relatively small-scale, and temporary in nature, we managed to work round some of the difficulties that publicly owned companies can suffer from, and to which I have alluded earlier. If it was put on a bigger scale and onto a long-term footing, then these problems would surely surface as big problems interfering to prevent the effective and efficient running of these businesses. My second reason for not running franchises in the public sector is this: a properly run competition really does drive innovation and value for money. The evidence is all around us. I know from my own experience of leading franchise bids that you don’t win them by being conservative with your revenue proposals or profligate with your costs. Franchising has produced a growing railway that enables more economic activity and can improve social cohesion, all while reducing the net cost to the taxpayer. We need to take steps to protect franchising now because it has done a lot for us over the last 20 years, but it needs reinvigorating with new players. To attract these new players, there must be an opportunity to make a reasonable return for doing a great job. It is government’s role (both national and devolved) to create the right policy conditions to enable franchising to flourish in the future.